I so hope you are all satisfied with what I'm showing you. Keep in mind anything can change! Whew, what a whirlwind the last few days have brought my way. The strikeoffs didn't arrive til after work last Friday. I started Saturday and didn't finish until Monday just in time to overnite my color corrections off to Michael Miller Fabrics. I was slow, I know, but I really had very little knowledge on how to go about the task. Sandi Henderson was so kind as to help once again and Jennifer came in to help on Sunday, as well. So today I was happy to finally just play with the small pieces I had, and try to envision what I might do with them. But, alas, Kathy called and asked me to overnite the fabrics to them. Jennifer and I have very quickly snapped some shots before we had to box everything up and kiss it all goodbye for the moment. This is not the only project we have going on right now. Oh no, this is the very busy time of year for designing new products, photography, new catalogs, price sheets, packing and sending crates, shows and filling orders. And I wondered what I'd do with myself when the kids left home!!! Thank you all for your kind comments and interest. I'd love to hear your thoughts on what you think about the fabrics. Lots more where that came from. Go easy, it's my first try at this fabric thing. Also, colors on several pieces are off and hopefully will come back much better on the next round. Unfortunately, my Studio reveal is delayed. Woodrow is getting impatient with me, as I'm sure you must be. Hopefully, worth the wait??? OH my goodness Paula!!! 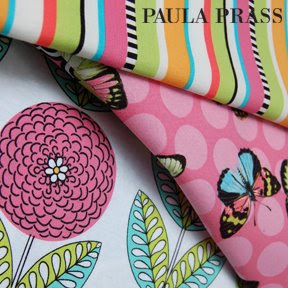 Your fabric is beyond LOVELY...and SO fun!!!! I can't wait to get my hands on some of it....truly, I love it! You creative woman you! My thoughts? Yay! Yay! Yay! They're so fun. I can't wait to see more! Just beautiful. They seem like such a diverse bunch of prints. Something for everyone! I'm enjoying hearing about the fabric design process...thanx for that. Okay....they are even MORE gorgeous then I imagined they would be! STUNNING, Paula! I know I already told you that, but I wanted to repeat myself. I am truly excited for you and cannot wait till Market when we can show off our goodies! YAY!!! Your fabric is so fun! I'm looking forward to sewing with them! Congratulations. Stunning! Can't wait for them to arrive in person. I already see several must haves! Gorgeous job you did here!! Just discovered you. Designs and colours look very nice! Looking forward to seeing the final stuff. 1st time? Looks like you're a pro. The collection looks great! I wish you much success, as I'm sure you will have. Congrats! This is an exciting time. Your fabric is going to be FABULOUS!!!!! I can't wait for it to hit the shelves! I just came over from jcaroline's blog and I'm so glad she directed me this way! What absolutely GORGEOUS fabric. How lucky we are that jcaroline shared those sneak peeks..!! :) I will definiltely be keeping my eye out for its release. Good luck with the rest of the process - enjoy the adventure. Paula, this line is GREAT! You have birds and you have orange, nothing could be better! best wishes! Just found you through JCaroline. Oh your fabrics and colors are gorgeous. Wishing you lots of success!!! Wowwy wow wow. 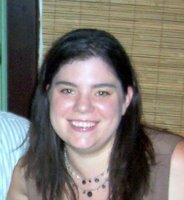 I found you through the jcaroline blog... And now I'm subscribed to your blog too! 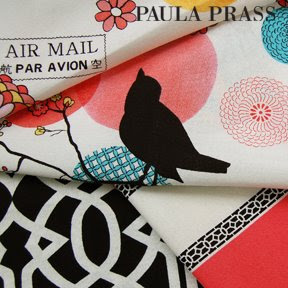 Love this collection to pieces, I can not wait to make some little kid and baby stuff for my daughters with that Par Avion print... Great stuff, lady! Oh Paula, they are so beautiful. It's not just the colors. There are many of these around. Those are chic, too! Bravo! Oh my goodness, these are gorgeous! I can already see some of these making an appearance in my house! Congratulations Paula! It all looks wonderful. i found your blog through Southerndaze or cyndiandlee.blogspot.com. i love your fabrics and all your adorable prints. i can't wait to find it!!! Oh Paula....I'm so thrilled you stopped by to say hi. I has so much fun catching up on all of your happenings. I am in *love* with your favorites. I think the second to last is my favorite, but they're all wonderful. Best wishes for a successful rollout--I know they will be a huge hit! The birds are gorgeous, and I love the stripe and geometric/celtic prints! Oh my!!! You fabrics look truly amazing. I can't wait to see everything in person. Gorgeous! Those are so gorgeous Paula! You really knocked them out of the ball park! But you do that with all your work. You're so talented! Oh Paula, I am smitten! I can't even say how much I love what I am seeing! Thanks for your sweet comment on Skinny laMinx. Great to meet you and see your beeoootiful work! Wow, these fabrics are just lovely. Good luck. I'm glad I stumbled onto your site. just found your blog, congrats on your new print line! It's beautiful! Good work. This fabric is stunning. What an achievement - can't wait to create with it! i found your blog via design sponge. 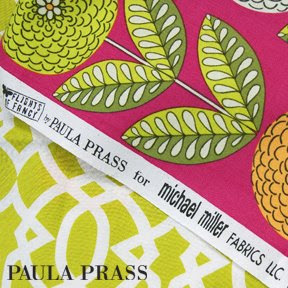 i love your fabrics and your studio makeover is so great! The colors and patterns make me smile ! very, very nice....love the mum print especially. oh, my, they are all lovely!! i can't wait to get my hands on them!!! I just found your blog and I have to say I am in love with those fabrics! Can't wait to them to hit the store. I can't wait for them to hit the stores! They are stunning! 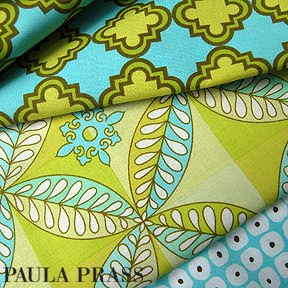 Wow, I just found your blog from Craft Apple, and checked out these fabrics. They are so gorgeous! I will be watching for them in the stores as they will be so great for the young girls in my life! I can't wait!